April was a busy month. Work was hectic, budgets were due, and I took a week long vacation to Southern California to visit the mouse with the family. And, we bought chickens, so several days were spent building a coop and run to house our new feathered friends. I found myself needing a break from snowboarding after a grueling winter of ski patrol, and was really enjoying working around the house and property, getting the yard in shape and the garden in. 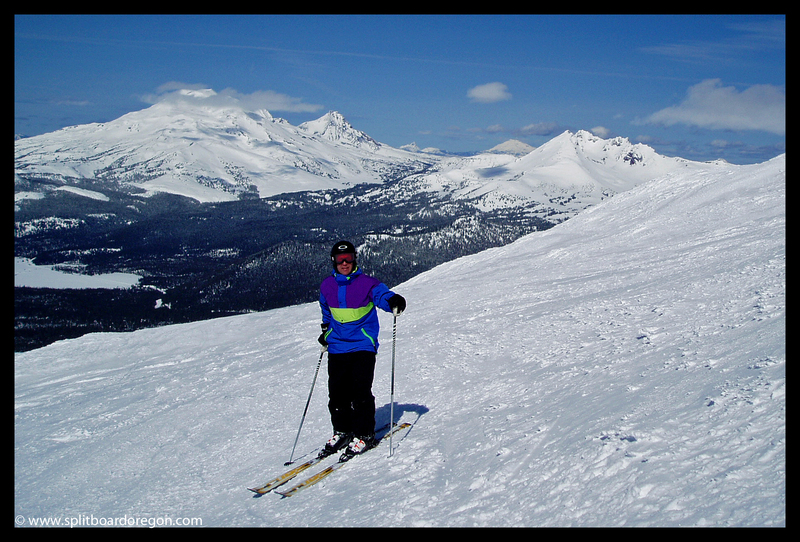 I did manage a couple days at both Willamette Pass and Mt Bachelor, but didn’t pack the camera with me. Being able to free ride lifts in the corn snow without the weight of a pack and camera was pretty dreamy. 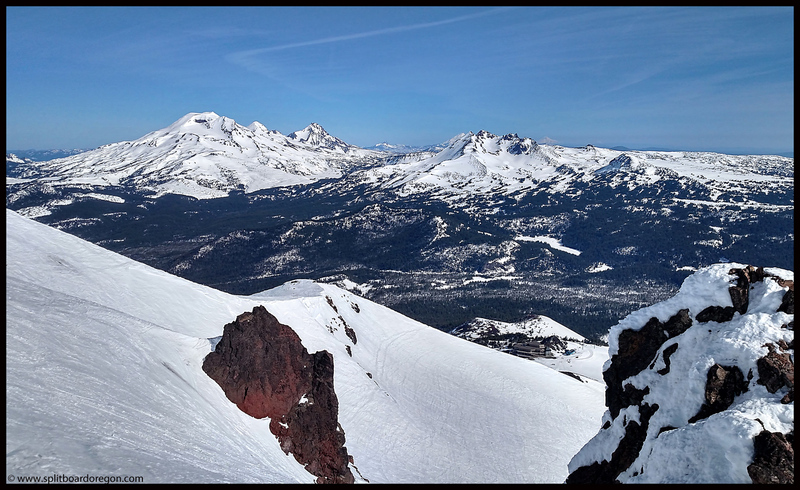 I actually only took one photo of snow the entire month of April, from the summit of Mt Bachelor on a perfect sunny morning. 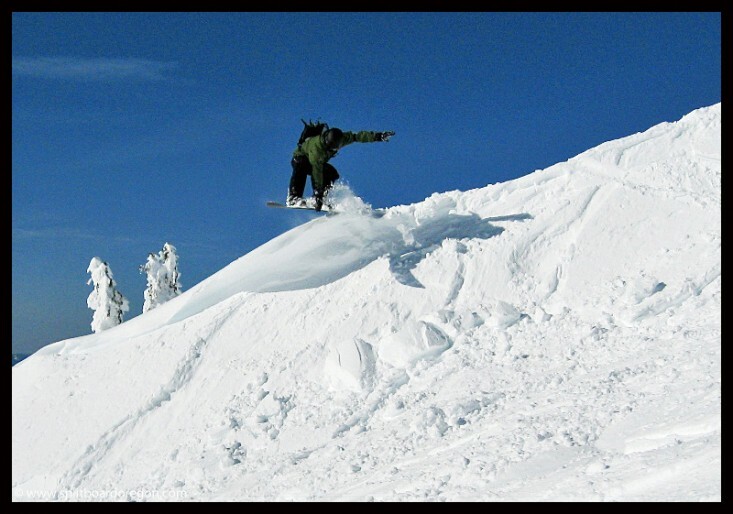 Spending a couple days making runs with a few close friends down the likes of SDN and White Russian at Willamette, and the Cirque Bowl and the Southside at Bachelor, in great April corn snow, reminded me of great days from past years. With the month of April past, and the busy season at work wrapping up, I’m definitely ready to head back out again for some more riding. Conditions are shaping up to be an awesome May and June! Free lift ticket, check. Free ride, check. Bluebird day, check. Fresh snow, check. 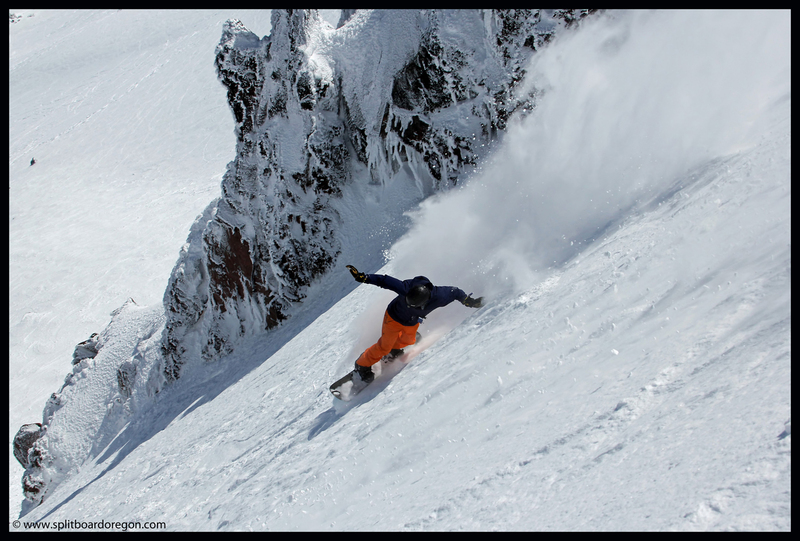 All the signs pointed to a rare day of excellent lift served turns at Mt Bachelor. I left my house at 5:30 am and drove south where I met Andy at his house in Eugene and loaded my gear into his Jeep for the drive east to central Oregon. Andy had won a pair of lift tickets from a local promotion a few months back, and since I’d driven to the mountains the last couple of trips, he’d offered me a ticket and a ride as an exchange. After a brief stop at the Mickey D’s in Oakridge for some breakfast, we arrived in the Bachelor parking lot just after 9:00 in full sunshine. The temperature was around 25 degrees in the base area. We met Todd, who’d driven over the night prior for some camping, loaded the Pine Marten Express, and headed up. Our intentions were to head to the summit to check out the snow, which is what we did. Our first run off the Summit Express was on Cow’s Face, and there were pockets of wind sifted powder that were really nice. The snow was a bit variable however, so we decided to check out the Cirque Bowl from the summit proper on the next run. After a few minutes of hiking, we found what we were looking for….. 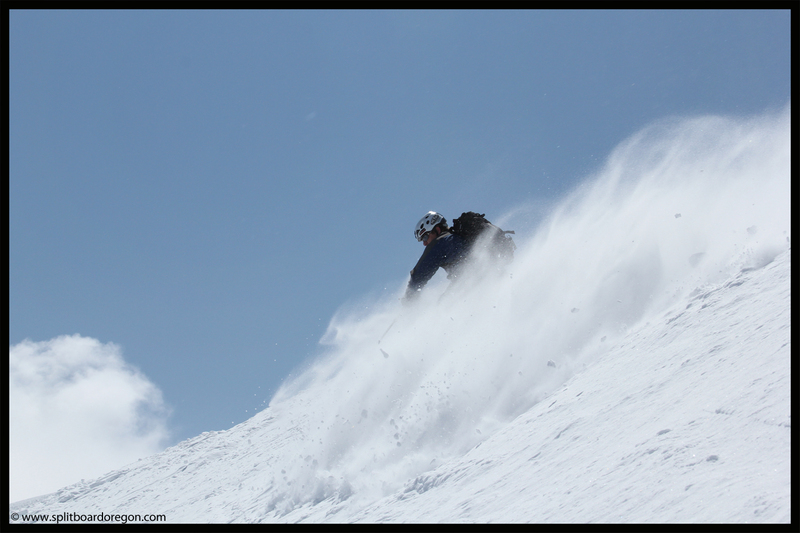 The snow directly off the summit was prime – nice wind packed powder. The steep slopes of the top yielded face shots for me on each turn, and I’d mistakenly worn my sunglasses instead of goggles, so several times throughout the day I’d have to stop and clear the pow off the insides of my lenses. For the next several runs, we repeated the hike to the summit and dropped off just to the riders left of the center pinnacle. Each run was as good as the last, and the snow stayed perfect on the northerly aspect all day long. After several runs, Todd decided to call it a day. 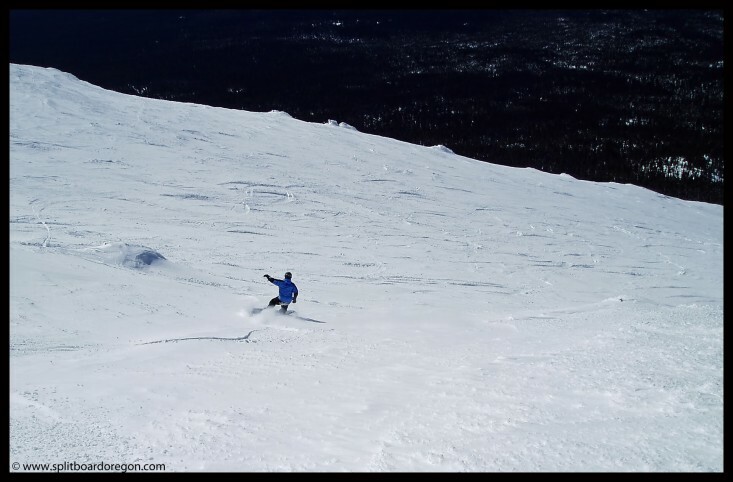 Andy and I continued to make turns, enjoying a few runs on the groomers of Skyliner on the lower mountain. The park was in good shape, with huge tables and rail features. It didn’t take long though until we found ourselves back on the Summit lift heading for the good snow on the upper mountain. The entire area around the summit was covered in the usual cascade volcano sastrugi, which always looks really cool and makes for a decent photo. 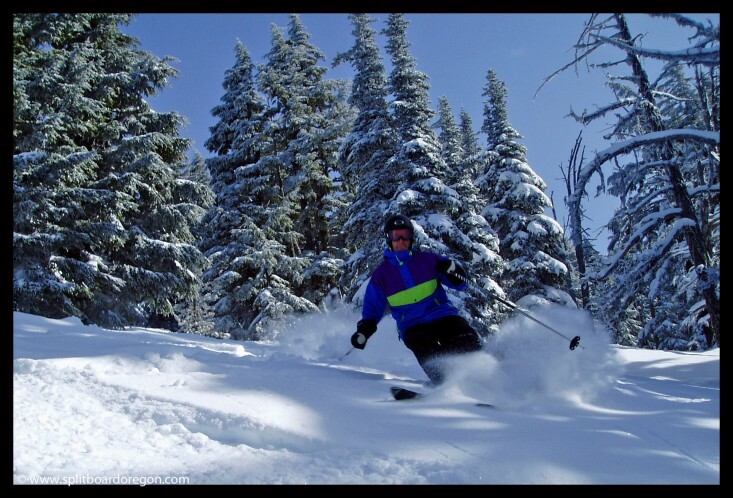 Here’s a shot Andy took looking back at the top of the Summit Express lift…..
More powder turns followed, and Andy continued to rip up the wind packed snow with his snow blades with the precision of a surgeon…. We skied until the lifts closed at 2:00, and made one of the last runs off the top. I was pretty tired at the end of the day from all the laps (when I checked Bachelor’s website the following day with my ticket number I saw we’d made over 23,000 vertical feet of turns – not too shabby considering we spent quite a bit of time hiking to the true summit for most of our runs). Down at the car, it felt nice to get out of our winter clothing and change into flip flops and shorts. Three hours later we were back in Eugene, and enjoying a cold beer after an awesome day of May powder! Days like these remind me I do enjoy riding at the resort and that it’s nice to find a balance between backcountry and lift accessed turns! 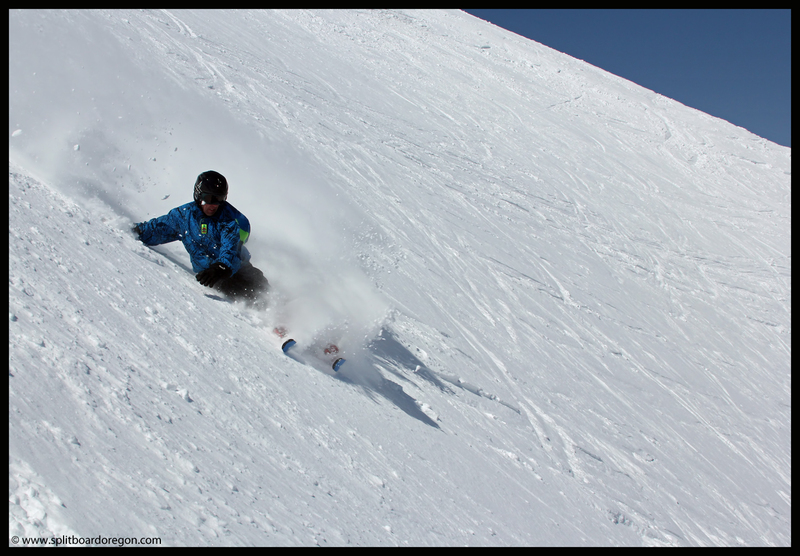 Here’s a parting shot of Andy on the last run of the day…. Andy and I headed to Mt Bachelor for a final day of lift served riding and to get some turns in for the month of May. With so much snow this year, the Cascades Lakes Highway was yet to open, so the Three Sisters would have to wait until June. Access to Diamond Peak was also suspect, so we made the most of riding in-bounds. There weren’t too many people around, and the only lift that was operating was the Sunrise Express because the weather wasn’t cooperative to open the Summit Chair. We made lots of runs down lower through the trees and traversed out towards the Pine Marten Express and past the closed trail signs. 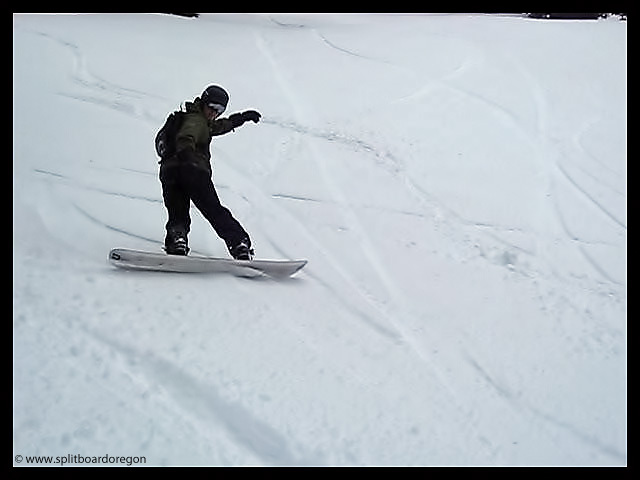 I was ripping it up on my Burton Dominant 156, and it was really fun riding the runs jumping over little trees and rocks. We made several laps and left the hill around 1:00. I’m really looking forward to some improved weather and access to the higher peaks later this Spring/Summer. 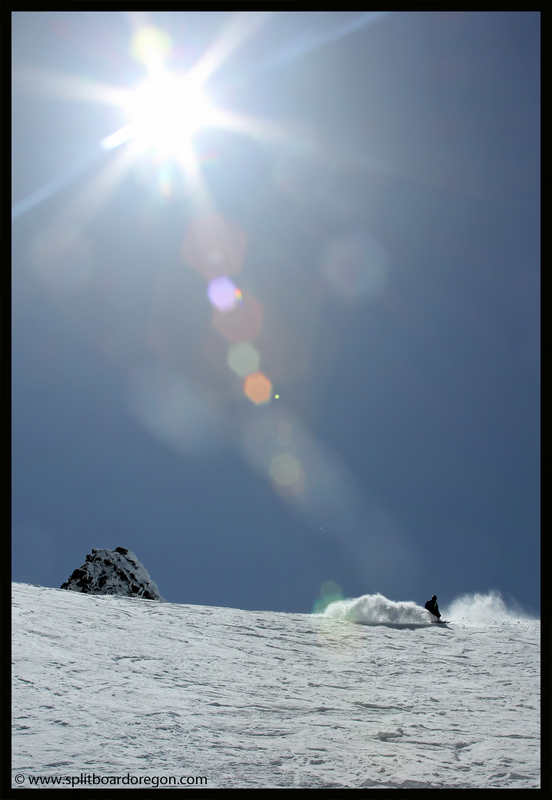 Sunshine was in the forecast, so Andy, Todd and I headed over from the valley to make some spring turns on Mt. Bachelor. Most of our day was spent riding the terrain off the summit lift, with some good turns found on the mountain’s south side. The base is holding up well on the mountain and should make for good turns this spring in the backcountry. 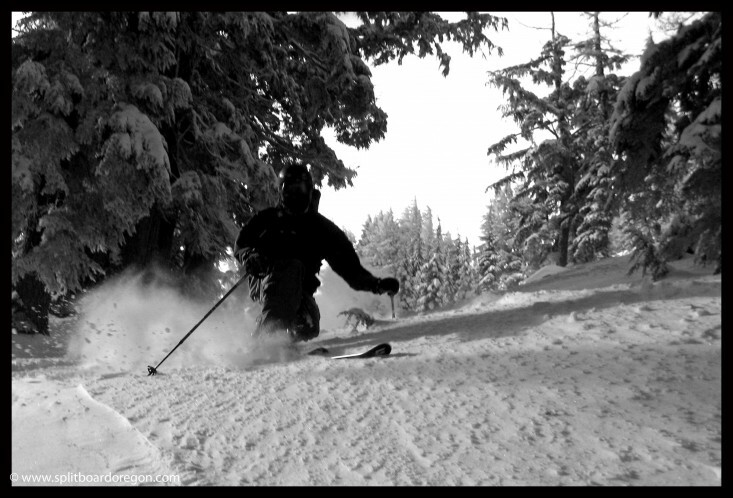 Overall, it was another good day of riding on the mountain and well worth the long drive from the Willamette Valley! It had been snowing hard all week and the Oregon Cascades were blanketed with another round of late season powder, so Andy and I made plans to head back over to Mt. Bachelor for a day of riding. 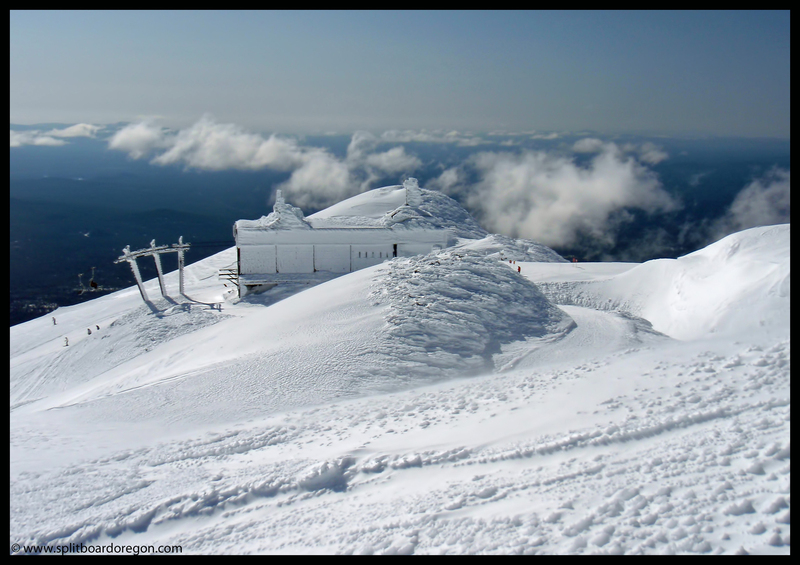 The forecast was calling for clear skies and cold temperatures, which meant the summit chair would likely be spinning. We arrived at the hill early after making the long drive from the valley and found very few people in the parking lot – typical for later in the season. We made a few laps on the front side of the mountain and headed for the summit chair as soon as it opened. Dropping into the summit bowl was tempting, but we opted for the long continuous untracked vertical of the southside. 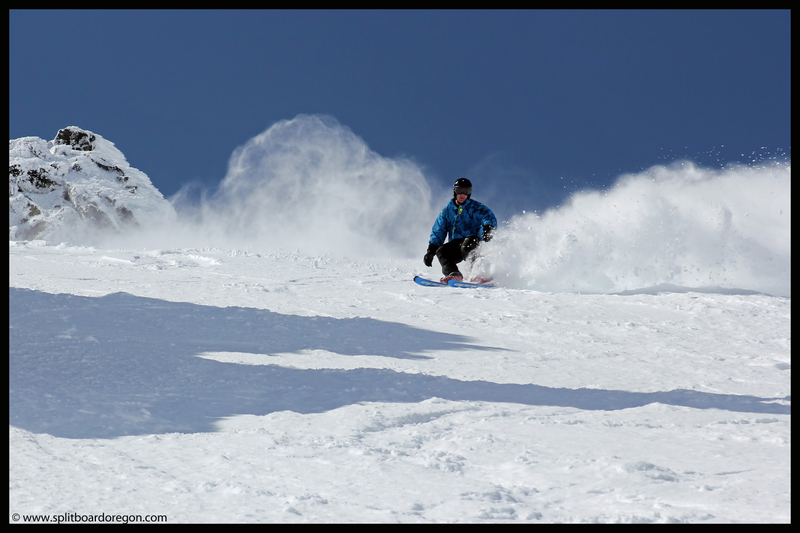 As is typical, the upper 500 feet or so of the backside was wind blown and crusty, but below that the snow was fresh pow! 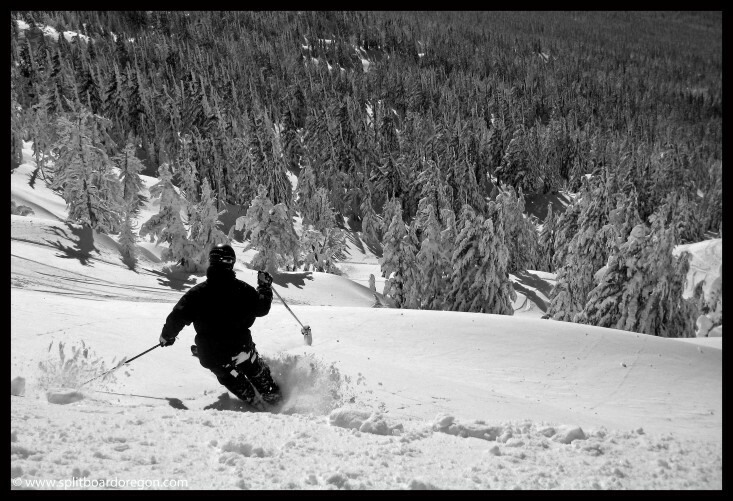 The run back to the Northwest Chair along the cat track is always fun, with lots of natural features to ollie, jump and jib. We repeated the southside route for most of the day, dropping in off the top at various places and taking slightly different lines each time. I love the backside of Bachelor. It has a bit of everything – open bowls, cornice drops, glades, and trees. At the days end, we loaded our gear in the truck and headed out, stopping in Sunriver for a well earned hot coffee, satisfied with a great day of April snow riding!